Were you injured in an accident in Lithonia, Georgia? Confused about whether or not you have an accident claim? Get straight answers from an experienced Lithonia personal injury attorney you can trust. Talk to a lawyer at our law firm today. The Law Offices of Gary Martin Hays & Associates, P.C. is proud to stand up for victims in Lithonia and throughout DeKalb County. We are located just blocks away from downtown Lithonia. Our office has a unique history to the city, having been built over 100 years ago. Our close proximity to I-20 makes it easy for injured victims to meet us for a free consultation at our Lithonia office. And if you can't come to us, we can come to you. Our personal injury attorneys frequently travel throughout DeKalb County and the surrounding communities to meet with potential clients at home, at work or in their hospital rooms. Remember, you didn't do anything wrong. You shouldn't have to pay for someone else's reckless or negligent behavior. We know how to investigate accident claims. We know how to negotiate with insurance companies. And if they refuse to cooperate, we're prepared to take them to court. We're here for you when you need us most. We also handle wrongful death claims on behalf of Lithonia and DeKalb County families who have lost loved ones due to the negligence of others. These cases are extremely complicated and often require a tremendous amount of work. Some law firms avoid such tough cases. We thrive on them. That's because we know what a difference they can make in the lives of injury victims and their families. For us, such cases are about more than just money. They're about helping families who need our help the most. Don't try to deal with the insurance companies alone. Fighting for fair compensation for your medical bills, lost wages, and many other expenses after an accident can be extremely complicated. Our legal team can thoroughly investigate your claim, build the strongest case possible and stand up to the insurance companies on your behalf. That way, you can focus on what matters most - your recovery. Best of all, we offer a "zero fee" guarantee. That means you don't owe us a cent unless we recover for you. There's no cost and no obligation. We just want you to be aware of your legal rights and options. Contact us today to schedule your free case evaluation. So whether you were injured in a vehicle accident, hurt on the job, or were the victim of a violent crime, our team of experienced Lithonia personal injury lawyers can fight for you and demand the justice you deserve. Were you injured in a distracted driving accident on Max Cleland Boulevard? Are you dealing with a rear-end accident on Center Street or another nearby road in Lithonia? Don't underestimate the complexity of your case. Talk to an experienced Lithonia car accident attorney who knows how to handle such claims and understands how the legal system works in DeKalb County. Our lawyers have been working with injury victims and their families for years. That's why we have such a strong track record of success. Commercial truck accidents in Lithonia can be very serious and frequently result in severe injuries. If a truck driver caused your accident, you might think you don't even need a truck accident attorney to handle your claim. But the reality is truck accidents often turn out to be extremely complicated. That's because you're not just dealing with the truck driver. In many cases, in order to obtain a financial settlement, you'll need to deal with a trucking company, the company that loaded the truck and maybe even the company that manufactured the products. And in each case, each one has a different insurance company and attorney. We know how to deal with all of them and negotiate the best possible deal. And if they refuse to cooperate, we're prepared to take them to court. Injured in a motorcycle accident caused by another driver in Lithonia, Georgia? Not sure if you're eligible for financial compensation? Contact our law firm and talk to a Lithonia motorcycle accident attorney who understands how the legal system works in DeKalb County. We know what evidence to look for. And we understand the challenges and biases injured motorcyclists often face after a crash. Instead of helping injured motorcyclists, most insurance companies point the finger at them and blame them for being reckless or out of control. We know the truth. We know that most motorcyclists follow the rules of the road. And we're here to help you set the record straight. Injured while crossing Center Street in Lithonia? Perhaps a distracted driver is to blame? Or maybe you're dealing with a pedestrian accident involving a speeding driver on Conyers Street or a drunk driver on Stone Mountain Street? Whatever the circumstances of your Lithonia pedestrian accident, attorney Gary Martin Hays and his talented legal team want to work with you. We know the excuses drivers often use to try to avoid responsibility for an accident. We know the games insurance companies play. And we know how to take them on and win. That's why we're eager to meet with you as soon as possible at our Lithonia office. Personal injury cases in Lithonia can cover a wide range - slip and fall accidents on Main Street, dog bites on College Avenue or sometimes even swimming pool accidents on Bruce Street or another road in Lithonia. Whatever type of accident you're dealing with, if someone caused your injury, they should be held responsible for their actions. That's why we want to meet with you. 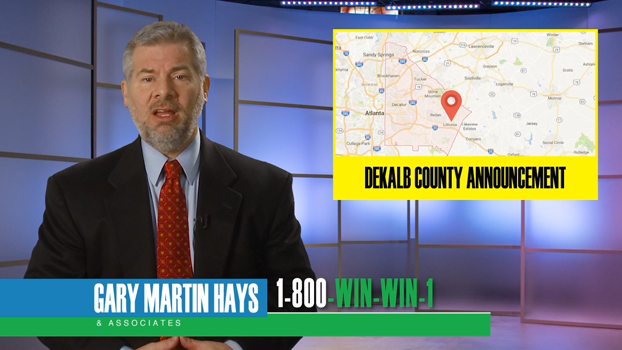 At the Law Offices of Gary Martin Hays & Associates, P.C., we know how the legal system works in DeKalb County. We know what evidence to look for. We know how to effectively negotiate with insurance companies. And if they refuse to cooperate, we're prepared to take them to court on your behalf. Let us fight for justice for you. Contact our law firm right now. Workplace injuries can be very serious and very confusing as well. If you were hurt at work in Lithonia or anywhere else in Georgia, you should be eligible to receive workers' compensation from the state. But many workers' comp cases often turn out to be far more complicated than many people expect. Sometimes, it's because employers or insurance companies try to downplay the severity of your injury. Or they might try to claim you hurt yourself outside of work, which would mean that they're not responsible for compensating you. You know what happened. You know you sustained your injury on the job. And it's our job to help you prove that and help you secure maximum financial compensation. That way, you can focus on what matters most - your recovery.